The appropriate way of measured data visualization is an important factor which has a significant impact to its quality as well as to the speed of the data analysis. Especially when the analysis is carried out by a multidisciplinary team. The virtual reality is one of the techniques used for data visualization. It is progressive technology which enables better and faster understanding to visualized data. 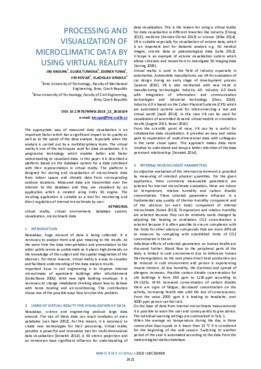 In this paper it is described a platform based on the database system for a data combined with their representation in virtual reality. The platform is designed for storing and visualization of microclimatic data from indoor spaces and climatic data from corresponding outdoor locations. Measured data are transmitted over the Internet to the database and they are visualized by an application which is created using Unity3D engine. The resulting application is suitable as a tool for monitoring and direct regulation of internal microclimate by user.